UNOG Library; ref. : C.528. M.313. 1922. VI. During the two years that followed the end of the war in 1918—and in accordance with the Sykes-Picot Agreement signed by Britain and France during the war—the British held control of most of Ottoman Mesopotamia (modern Iraq) and the southern part of Ottoman Syria (Palestine and Transjordan), while the French controlled the rest of Ottoman Syria, Lebanon, Alexandretta (Hatay) and other portions of southeastern Turkey. 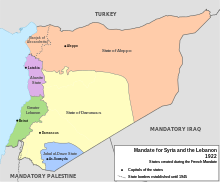 In the early 1920s, British and French control of these territories became formalized by the League of Nations' mandate system, and on 29 September 1923 France was assigned the League of Nations mandate of Syria, which included the territory of present-day Lebanon and Alexandretta in addition to Syria proper. The administration of the region under the French was carried out through a number of different governments and territories, including the Syrian Federation (1922–24), the State of Syria (1924–30) and the Syrian Republic (1930–1958), as well as smaller states: the State of Greater Lebanon, the Alawite State and Jabal Druze State. Hatay was annexed by Turkey in 1939. The French mandate lasted until 1943, when two independent countries emerged, Syria and Lebanon. French troops completely left Syria and Lebanon in 1946. With the defeat of the Ottomans in Syria, British troops, under General Sir Edmund Allenby, entered Damascus in 1918 accompanied by troops of the Arab Revolt led by Faisal, son of Sharif Hussein of Mecca. Faisal established the first new postwar Arab government in Damascus in October 1918, and named Ali Rida Pasha ar-Rikabi a military governor. However, in accordance with the secret Sykes–Picot Agreement between Britain and France, General Allenby assigned to the Arab administration only the interior regions of Syria (the eastern zone). Palestine (the southern zone) was reserved for the British. On 8 October, French troops disembarked in Beirut and occupied the Lebanese coastal region south to Naqoura (the western zone), replacing British troops there. The French immediately dissolved the local Arab governments in the region. France demanded full implementation of the Sykes–Picot Agreement, with Syria under its control. On 26 November 1919, British forces withdrew from Damascus to avoid confrontation with the French, leaving the Arab government to face France. Faisal had travelled several times to Europe, since November 1918, trying to convince France and Britain to change their positions, but without success. France's determination to intervene in Syria was shown by the naming of General Henri Gouraud as high commissioner in Syria and Cilicia. At the Paris Peace Conference, Faisal found himself in an even weaker position when the European powers decided to ignore the Arab demands. In May 1919, elections were held for the Syrian National Congress, which convened in Damascus. 80% of seats went to conservatives. However, the minority included dynamic Arab nationalist figures such as Jamil Mardam Bey, Shukri al-Kuwatli, Ahmad al-Qadri, Ibrahim Hanano, and Riyad as-Solh. The head was moderate nationalist Hashim al-Atassi. In June 1919, the American King–Crane Commission arrived in Syria to inquire into local public opinion about the future of the country. The commission's remit extended from Aleppo to Beersheba. They visited 36 major cities, met with more than 2,000 delegations from more than 300 villages, and received more than 3,000 petitions. Their conclusions confirmed the opposition of Syrians to the mandate in their country as well as to the Balfour Declaration, and their demand for a unified Greater Syria encompassing Palestine. The conclusions of the commission were rejected by France and ignored by Britain. Unrest erupted in Syria when Faisal accepted a compromise with French Prime Minister Clemenceau and Zionist leader Chaim Weizmann over the issue of Jewish immigration to Palestine. [clarification needed]Anti-Hashemite demonstrations broke out, and Muslim inhabitants in and around Mount Lebanon revolted in fear of being incorporated into a new, mainly Christian, state of Greater Lebanon. A part of France's claim to these territories in the Levant was that France was a protector of the minority Christian communities. In March 1920, the Congress in Damascus adopted a resolution rejecting the Faisal-Clemenceau accords. The congress declared the independence of Syria in her natural borders (including Southern Syria or Palestine), and proclaimed Faisal the king of all Arabs. Faisal invited Ali Rida al-Rikabi to form a government. The congress also proclaimed political and economic union with neighboring Iraq and demanded its independence as well. On 25 April, the supreme inter-Allied council, which was formulating the Treaty of Sèvres, granted France the mandate of Syria (including Lebanon), and granted Britain the Mandate of Palestine (including Jordan), and Iraq. Syrians reacted with violent demonstrations, and a new government headed by Hashim al-Atassi was formed on 7 May 1920. The new government decided to organize general conscription and began forming an army. These decisions provoked adverse reactions by France as well as by the Maronite patriarchate of Mount Lebanon, which denounced the decisions as a "coup d'état". In Beirut, the Christian press expressed its hostility to the decisions of Faisal's government. Lebanese nationalists used the crisis to convene a council of Christian figures in Baabda that proclaimed the independence of Lebanon on 22 March 1920. On 14 July 1920, General Gouraud issued an ultimatum to Faisal, giving him the choice between submission or abdication. Realizing that the power balance was not in his favor, Faisal chose to cooperate. However, the young minister of war, Youssef al-Azmeh, refused to comply. In the resulting Franco-Syrian War, Syrian troops under al-Azmeh, composed of the little remaining troops of the Arab army and Bedouin horsemen and civilian volunteers met the better trained 12,000 strong French forces under General Mariano Goybet at the Battle of Maysaloun. The French won the battle in less than a day and Azmeh died on the battlefield along with many of the Syrian troops, while the remaining troops possibly defected. General Goybet captured Damascus faced with little resistance on 24 July 1920, and the mandate was written in London two years later on 24 July 1922. Arriving in Lebanon, the French were received as liberators by the Christian community, but entering Syria, they were faced with strong resistance. The drawing of those states was based in part on the sectarian makeup on the ground in Syria. However, nearly all the Syrian sects were hostile to the French mandate and to the division it created. This was best demonstrated by the numerous revolts that the French encountered in all of the Syrian states. Maronite Christians of Mount Lebanon, on the other hand, were a community with a dream of independence that was being realized under the French; therefore, Greater Lebanon was the exception among the newly formed states. It took France three years from 1920 to 1923 to gain full control over Syria and to quell all the insurgencies that broke out, notably in the Alawite territories, Mount Druze and Aleppo. On August 3, 1920, Arrêté 299 of the Haut-commissariat de la République française en Syrie et au Liban linked the cazas of Hasbaya, Rachaya, Maallaka and Baalbeck to what was then known as the Autonomous Territory of Lebanon. Then on 31 August 1920, General Gouraud signed Arrêté 318 delimiting the State of Greater Lebanon, with explanatory notes stating that Lebanon would be treated separately from the rest of Syria. On 1 September 1920, General Gouraud publicly proclaimed the creation of the State of Greater Lebanon (French: État du Grand Liban, Arabic: دولة لبنان الكبير‎) at a ceremony in Beirut. Greater Lebanon was created by France to be a "safe haven" for the Maronite population of the mutasarrifia (Ottoman administrative unit) of Mount Lebanon. Mt. Lebanon, an area with a Maronite majority, had enjoyed varying degrees of autonomy during the Ottoman era. However, in addition to the Maronite Mutasarrifia other, mainly Muslim, regions were added, forming "Greater" Lebanon. Those regions correspond today to North Lebanon, south Lebanon, Biqa' valley, and Beirut. The capital of Greater Lebanon was Beirut. The new state was granted a flag merging the French flag with the cedar of Lebanon. 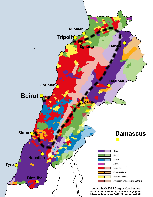 Maronites were the majority in Lebanon and managed to preserve its independence; an independence that created a unique precedent in the Arab world as Lebanon was the first Arab country in which Christians were not a minority. The State of Greater Lebanon existed until 23 May 1926, after which it became the Lebanese Republic. Most Muslims in Greater Lebanon rejected the new state upon its creation. Some believe that the continuous Muslim demand for reunification with Syria eventually brought about an armed conflict between Muslims and Christians in 1958 when Lebanese Muslims wanted to join the newly proclaimed United Arab Republic, while Lebanese Christians were strongly opposed. However, most members of the Lebanese Muslim communities and their political elites were committed to the idea of being Lebanese citizens by the late 1930s, even though they also tended to nurture Arab nationalist sentiments. On 19 August 1920, General Gouraud signed Arrêté 314 which added to the autonomous sandjak of Alexandretta the cazas of Jisr el-Choughour, the madriyehs of Baher and Bujack (caza of Latakia), the moudiriyeh of Kinsaba (caza of Sahyoun) "with a view to the formation of the territories of Greater Lebanon and the Ansarieh Mountains"; where the "Ansarieh Mountains" area was to become the Alawite State. 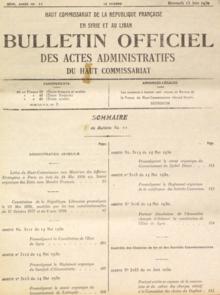 On 31 August 1920, the same day that the decree creating Greater Lebanon was signed, General Gouraud signed Arrêté 319 delimiting the State of Alawites, and Arrêté 317 adding the caza of Massyaf (Omranie) into the new State. The State of Alawites (French: État des Alaouites, Arabic: دولة العلويين‎) was located on the Syrian coast and incorporated a majority of Alawites, a branch of Shia Islam. The port city of Latakia was the capital of this state. Initially it was an autonomous territory under French rule known as the "Alawite Territories". It became part of the Syrian Federation in 1922, but left the federation again in 1924 and became the "State of Alawites". On 22 September 1930, it was renamed the "Independent Government of Latakia". The population at this time was 278,000. The government of Latakia finally joined the Syrian Republic on 5 December 1936. This state witnessed several rebellions against the French, including that of Salih al-Ali (1918-1920). On 28 June 1922 Arrêté 1459 created a "Federation of the Autonomous States of Syria" which included the State of Aleppo, the State of Damascus and the State of the Alawis. However, two and a half years later on 5 December 1924 Arrêté 2979 and Arrêté 2980 establishing the Alawite State as an independent state with Latakia as its capital, and separately unified the States of Aleppo and Damascus as from 1 January 1925 into a single State, renamed "d'État de Syrie" ("State of Syria"). In 1936, both Jebel Druze and the Alawite State were incorporated into the State of Syria. On 1 September 1920, the day after the creation of Greater Lebanon and the Alawite State, Arrêté 330 separated out of the previous "Gouvernement de Damas" ("Government of Damascus") an independent government known as the "Gouvernement d'Alep" ("Government of Aleppo"), including the autonomous sandjak of Alexandretta, which retained its administrative autonomy. The terms "Gouvernement d'Alep" "Gouvernement de Damas" were used interchangeably with "l'Etat d'Alep" and "l'Etat de Damas" – for example, Arrete 279 1 October 1920 stated in its preamble: "Vu l'arrêté No 330 du 1er Septembre 1920 créant l'Etat d'Alep". The State of Aleppo (1920–1925, French: État d'Alep, Arabic: دولة حلب‎) included a majority of Sunni Muslims. It covered northern Syria in addition to the entire fertile basin of river Euphrates of eastern Syria. These regions represented much of the agricultural and mineral wealth of Syria. The autonomous Sanjak of Alexandretta was added to the state of Aleppo in 1923. The capital was the northern city of Aleppo, which had large Christian and Jewish communities in addition to the Sunni Muslims. The state also incorporated minorities of Shiites and Alawites. Ethnic Kurds and Assyrians inhabited the eastern regions alongside the Arabs. The primarily Sunni population of the states of Aleppo and Damascus were strongly opposed to the division of Syria. This resulted in its quick end in 1925, when France united the states of Aleppo and Damascus into the State of Syria. Ethnographical map of Syria and Lebanon in a pre-World War I ethnographical map. The brown area around Alexandretta represents Turkish-speaking peoples. On 2 September 1938, the assembly proclaimed the Sanjak of Alexandretta as the Hatay State. The republic lasted for one year under joint French and Turkish military supervision. The name Hatay itself was proposed by Atatürk and the government was under Turkish control. In 1939, following a popular referendum, the Hatay State became a Turkish province. It was created for the Druze population of southern Syria. It had a population of some 50,000 and its capital in As-Suwayda. In 1936–1937, there was some autonomist agitation among Assyrians and Kurds, supported by some Bedouins, in the province of Al-Jazira. Its partisans wanted the French troops to stay in the province in the event of a Syrian independence, as they feared the nationalist Damascus government would replace minority officials by Muslim Arabs from the capital. The French authorities refused to consider any new status of autonomy inside Syria. In Quneitra and the Golan Region, there was a sizeable Circassian community. For the same reasons as their Assyrian, Kurdish and Bedouin counterparts in Al-Jazira province in 1936–1937, several Circassian leaders wanted a special autonomy status for their region in 1938, as they feared the prospect of living in an independent Syrian republic under a nationalist Arab government hostile towards the minorities. They also wanted the Golan region to become a national homeland for Circassian refugees from the Caucasus. A Circassian battalion served in the French Army of the Levant and had helped it against the Arab nationalist uprisings. As in Al-Jazira Province, the French authorities refused to grant any autonomy status to the Golan Circassians. ^ a b Myers, Denys P. (1 January 1921). "The Mandate System of the League of Nations". 96: 74–77. JSTOR 1014872. ^ a b Bentwich, Norman (1930). The Mandates System. Longmans, Green and Co. p. 172. ^ "11. French Syria (1919-1946)". UCA.edu. Retrieved 25 January 2017. ^ "The Avalon Project : The Sykes-Picot Agreement : 1916". yale.edu. Retrieved 25 January 2017. ^ "King-Crane Commission Report: Index". hri.org. Retrieved 25 January 2017. ^ "Digication e-Portfolio :: Modern World History Reader :: Resolutions of the General Syrian Congress (1919)". digication.com. Retrieved 25 January 2017. ^ Firro, Kais (8 February 2003). "Inventing Lebanon: Nationalism and the State Under the Mandate". I.B.Tauris. p. 18. Retrieved 25 January 2017 – via Google Books. ^ Hakim, Carol (19 January 2013). "The Origins of the Lebanese National Idea: 1840–1920". University of California Press. Retrieved 25 January 2017 – via Google Books. ^ "French Mandate of Greater Lebanon 1920-1943 (Lebanon)". crwflags.com. Retrieved 25 January 2017. ^ "MICHEL CHIHA - STATEHOOD". michelchiha.org. Retrieved 25 January 2017. 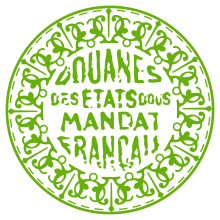 ^ Arrêté 317, 31 August 1920: "que le caza d'Omranié (Massyaf), dépendance de la wilayet de Damas, est peuplé en très grande majorité de populations alaouites et que ce caza doit en conséquence faire partie du groupement Ansarieh actuellement en voie d'organisation" [Translation: "the caza of Omranie (Massyaf), a dependency of the wilayet of Damascus, is overwhelmingly populated by Alaouite populations and that this caza must consequently be part of the Ansarieh grouping currently in the process of organization"]. "Attendu que la France en acceptant le mandat sur la Syrie n'a poursuivi d'autre but que celui de permettre aux populations de réaliser leurs aspirations légitimes de liberté et d'autonomie, tout en assurant la libre jeu et le développement des intérêts économiques communs. Attendu qu'il importe, pour ce faire, de respecter, conformément aux engagements du gouvernement de la République française, les volontés populaires librement exprimées et, en conséquence, de prendre en considération les vœux des populations des régions de la wilayet d'Alep et encore rattachées au gouvernement de Damas; Attendu qu'il est nécessaire de mettre fin, en même temps, à une situation de fait qui, par une centralisation excessive et désormais inutile, complique l'administration du gouvernement de Damas et entrave la bonne marche des affaire de la circonscription administratives d'Alep." [Translate: "Whereas France accepting the mandate over Syria has pursued no other aim than to enable the people to realize their legitimate aspirations for freedom and autonomy, while ensuring the free play and development of economic interests common. Whereas it is important, in order to do so, to respect, in accordance with the commitments of the Government of the French Republic, the freely expressed popular will, and consequently to take into consideration the wishes of the populations of the wilayet regions of Aleppo, still attached to the government of Damascus; Whereas it is necessary at the same time to put an end to a situation which, by excessive and unnecessary centralization, complicates the administration of the Government of Damascus and hampers the smooth running of the affairs of the administrative district of Aleppo." Charles Burckhard (1925). Le mandat français en Syrie et au Liban: la politique et l'oeuvre de la France au Levant. Imprimerie Courrouy. Sami M. Moubayed (2006). Steel and silk: men and women who shaped Syria 1900–2000. Derek Hopwood (1988). Syria 1945–1986: politics and society.